A member of the Secret Service patrols in front of the White House, which was illuminated in pink for Breast Cancer Awareness Month, in Washington, D.C., on Oct. 1, 2017. 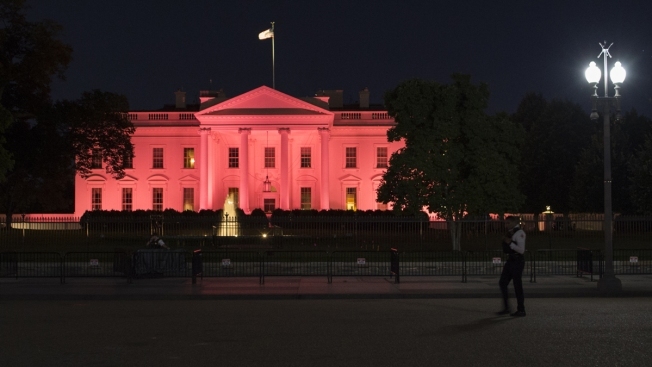 The White House lit up a bright shade of pink Sunday night to kick off Breast Cancer Awareness Month. First lady Melania Trump tweeted a photo of her hot pink view from inside the White House, saying, "In honor of National Breast Cancer Awareness Month we lit the @WhiteHouse pink!" In a statement, Trump encouraged women to talk to their doctors about mammograms and what they can do to reduce their risk of getting the disease. "More than 250,000 American women and 2,000 men will likely be diagnosed with some form of breast cancer in 2017. Because of early detection and improved treatment options, deaths from breast cancer have decreased significantly in the last decade, but there is still work to be done," read a statement from the White House.